This fact sheet looks at how farmers, gardeners and land managers can modify their practices to provide more food and water sources and improve habitat quality for for these insects. It highlights how moving to more bee-friendly practices can deliver other benefits too â&#x20AC;&#x201C; for wildlife and for people. nest holes in the ground, use cavities in trees, tunnel into plant stems, or collect mud, resin, foliage and plant fibres to construct their nests28. Good hedgerow management and leaving natural vegetation and undisturbed spots around the farm contribute to improved nesting habitat for these species29. Reducing reliance on pesticides in general: Phasing out hazardous pesticides and shifting to ecologically-informed Integrated Pest Management strategies is now endorsed by many global institutions and think-tanks30,31. Using IPM methods rather than current excessive levels of pesticide applications will support pollination services and more sustainable pest management, by avoiding harm to the beneficial insects which help control pests32. to bees and creating flowering ‘minimeadows’ in grassed areas. The public have been enthusiastic about the results and meadow creation can also cut down on lawn mowing, saving money for cashstrapped councils. A video clip shows the beautiful meadows sown around the London Olympic Games sites. Gardens Many pesticides for garden pest control contain neonicotinoids - something that gardeners may not be aware of. Our website lists UK pesticide products for ornamental and amateur uses which contain neonicotinoids (http://www. 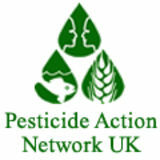 pan-uk.org/home-garden/list-of-home-andgarden-pesticides-containing-neonicotinoids). Gardeners and homeowners can help reduce risk to pollinators by avoiding pesticide application around plants in flower or in areas where bees are nesting. The best course of action for gardeners, for whom pest damage is cosmetic rather than economic, is to stop using pesticides at all38,39,40. Consumers can also demand that garden centres stop using neonicotinoids on pot plants in nurseries. More information and links to useful resources are given on our bees webpages. and schools to encourage bee-friendly practices in private gardens and public spaces. They offer training on beekeeping and support to market high quality urban honey. Their efforts include the 250 wild bee species that also need looking after. The Urban Pollinators project surveys the diversity and abundance of bee species in four UK cities, collecting data from gardens, parks, road verges, allotments, churchyards and cemeteries41. The aim is to find out which habitat types are best for pollinators and how these habitats can be expanded and improved. Urban habitats can be surprisingly important for pollinators, for example, 35% of the British hoverfly species were found to visit just a single garden in Leicester. In Edinburgh, the project is creating wildflower meadows in parks and schools, trialling different meadow types, comprising annual and perennial species42. 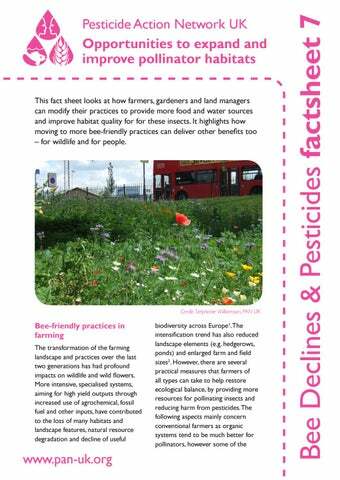 Key points •	Farmers can reduce harm to pollinators by avoiding the use of beetoxic pesticides and reducing use of herbicides which eliminate flowering plants in field margins. •	E	xpanding crop rotations, especially with legumes, leaving more uncultivated areas and sowing floral field strips increases habitat for pollinators and other wildlife. •	A voiding use of pesticides in private gardens should be promoted, favouring organic gardening. •	P lanting bee-favourite plants in gardens, parks and open spaces can expand pollinator foraging in urban landscapes. •	Shifting to more bee-friendly practices delivers other benefits, environmental and economic, to farmers, local authorities and society.